This attractive Brazilian Rosewood square grand #11329 was built in 1851 in the Chickering factory at 334 Washington St. in Boston, and is one of the earliest pianos ever built with a full-perimeter iron frame or stringplate, which Chickering was the first company to adopt. The growing demand for greater volume and resonance in pianos during the early 1800's led generally to larger cases with larger soundboard area, longer and thicker strings, more strings per note, and more notes in the low bass and high treble. All of these led to increased tension on the instrument's frame, and wood-framed piano designs were eventually unable to handle the string tension without warping and twisting. Many European and US companies experimented with small iron braces, bars, and partial stringplates, with varying degrees of success, with many instrument makers apparently fearful that too much iron in a piano would "destroy the resonance" of the wood. The full-perimeter stringplate was patented by Alpheus Babcock in the 1840s and first adopted in manufacturing by Chickering at about the time this instrument was built. Unlike many other early 19th century squares, this instrument shows no sign of frame warping after 158 years. In 1851 Chickering was the leading manufacturer of pianos in the United States, and probably in the world. They focused on producing high-quality instruments with excellent musical qualities, and in 1851 entered an iron-framed grand in the Great Exhibition in London that won a juried award. They were rare among US manufacturers in producing ANY grands, and probably more than 90% of their piano output was squares. 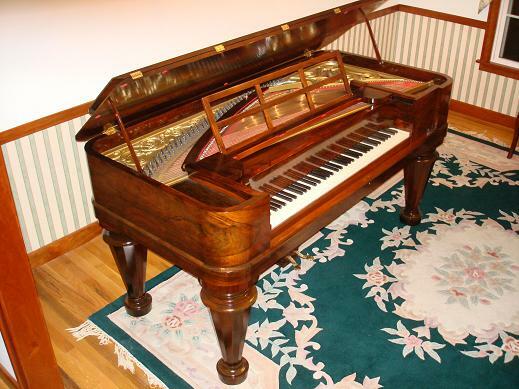 The upright didn't come on the scene until about 1870 after it was invented by Steinway. History simply does not support the common belief among modern piano technicians that "squares were always musically inferior" or were "oddball, transitional instruments" that were never considered to be serious or good instruments. A better explanation is that modern piano technicians generally don't know how squares were designed, built, or how to properly repair, maintain, or regulate them, so it is easier for them to dismiss them as "contemptible" rather than to deal with the real problems that come with maintaining instruments that are approaching 150 years old. The year after this piano was built Jonas Chickering, the company's founder, died leaving the firm to his sons. And a year later in 1853 the Boston factory was totally destroyed in a fire, so that Chickerings produced after that time were noticeably different from these earlier models. Also, in 1853 Heinrich Engelhardt Steinweg changed his name to Henry Steinway and with his sons Charles and Henry Jr. founded Steinway & Sons in New York, where they quickly supplanted Chickering as the leading US piano manufacturer. After Henry and his sons came to the US in 1851, they worked for several other major US piano manufacturers, including Chickering, to learn the business before founding their own firm. And the earliest Steinway pianos in 1853-1855 were all squares with full iron stringplates that are very similar in appearance and design to this Chickering--which perhaps a Steinway even had a direct hand in making. As the piano evolved Chickering gradually incorporated new technologies, although Chickering was not as innovative as Steinway. Many features of this instrument reflect its early design. It is "straight-strung" with all strings on a single bridge at one level, rather than "cross-strung", as developed by Steinway a few years later to allow for longer strings and greater resonance with multiple bridges nearer the middle of the soundboard. The stringplate rim is actually built into the wooden case as an integral part of it, rather than a separate piece bolted down to the frame--which means that the stringplate cannot be removed during rebuilding to get easier access to the soundboard or pin block, or to regild the plate. The piano has 78 notes or 6 1/2 octaves (C to F) with 3 fewer low notes and 7 fewer high notes than the typical modern 88-note piano. The piano is double-strung throughout except for the few lowest notes that are single-strung, and the string diameters are quite thin, so overall it has only about half the string mass and tension of a typical modern piano. It has a longer scale than many modern grands or uprights, so the sound is beautiful and pure, with lower anharmonicity. The soundboard is very thin, resonant, and responsive, and the hammers are very small and light, leading to a distinctive, but attractive bright sound and light action. The action is the known as a "Brown repetition action" which was used by Chickering in many pianos up until the early 20th century, and which has a different touch and feel than the "Herz-Erard repetition action" adopted by Steinway and most other makers. This instrument was carefully and conservatively restored by Historic Pianos in 2008, preserving many original parts to maintain the historical nature of the instrument. The case and keyboard ivories were in remarkably attractive and well-preserved original condition, but the piano was unplayable with only a few notes working, tuning stability was poor, and the bridges, strings, soundboard and action required significant restoration. The instrument was unstrung, with careful evaluation of components during the process. Like in modern uprights, the pinblock in a square is an integral part of the case that is difficult to replace, but is better protected from humidity changes than in a modern grand. This pinblock was found to be in excellent condition, with low but uniform torque on the original size #1 tuning pins, so that careful reaming allowed for restringing with size #2 pins (the same size used in most new pianos now) giving uniform and ideal torque for maximum tuning stability. Because it uses shorter tuning pins than can be purchased new today, antique #2 pins from another Chickering were cleaned and "blued" by traditional steel bluing processes. The rusted steel strings were replaced, but the original copper-wound bass strings were found to be still in excellent condition after cleaning. Because the 1851 winding style (locking the copper winding over the twisted eye-loop of the steel core wire and with copper winding over the string section that rests on the bridge) is no longer available from most replacement string makers, the original bass strings were reinstalled. The soundboard and bridge required extensive rebuilding to restore proper crown and eliminate tonal deficiencies caused by detached ribs, cracks, etc. The action was repaired, with complete replacement of leather hinges in the damper levers that had mostly broken, jamming the action. The original hammers are very petite and light relative to modern hammers, but they showed little wear and were still serviceable and resilient, so they were reshaped and retained. The dampers are also very tiny relative to modern instruments, and many of the small mahogany damper heads had been separated and reglued in the past--typically in random locations ignoring the size gradation from bass to treble, so that the damping was non-uniform and somewhat ineffective. The dampers were resorted by size and several missing damper heads fabricated, before reinstallation and regulation. New damper felt was custom-cut to fit the small dampers. The original French polish oil-and-shellac finish on the rosewood case was in remarkably good original condition, but was dirty, damaged in places, and had lost its surface luster due to wear and surface crazing, especially in areas exposed to sunlight. The finish was deeply cleaned and smoothed, without stripping or removing the finish, and was refurbished by impregnating and building with additional traditional French polish materials and hand-rubbing techniques, using oil, shellac, and pumice.